I have been supervising lifeguards for well over a decade. I have seen my share of excellent lifeguards. They keep the patrons safe and the pool sparkling. However, even the best lifeguards sometimes fail to enforce even simple pass policies. I’m going to share with you why they fail. Perhaps by understanding why they fail, you can adjust your pass policies and procedure to better accomplish your goal: keeping patrons out that don’t belong. Reason: Lifeguards enjoy making people happy. When a patron is turned away at the gate because he/she lacks a pass, it can be a real bummer. Especially if there are children who start crying. But the truth is, if a patron has not completed the necessary paperwork and signed a waiver, your facility may be liable if something bad happens. When the lifeguard does give in and allows a patron in against protocol, empathize with the guard about how difficult it is when patrons are disappointed, but reinforce the reason for the rule and clarify the expectation going forward. Reason: Lifeguards give into peer pressure. 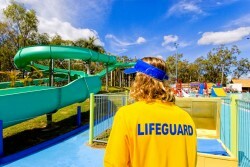 Lifeguards are under pressure from family and friends to let then swim at the facility where they work. I have even felt this pressure as an adult. I remember my mother saying, “Adam, you work for a pool company, I’m sure there are lots of pools we can swim at this summer!” Peer pressure is even worse when it comes from friends. If lifeguards can increase their social status at school by letting the neighborhood kids into the pool, they might do that. What to do: In general, friends and family can be a distraction and a liability and should not be permitted to use the pool. If friends or family members happen to live in the community, the same rules apply to them as any other patron. You’ll need to clearly discuss your expectations ahead of time. Reason: Lifeguards will not enforce a pass policy if they see management not enforcing the rules. If a lifeguard turns a patron away at the gate, but then receives a phone a few minutes later from management stating the patron is allowed in, this sends the wrong message. When the guard encounters a similar situation the next time, he/she is much more likely to skip the unpleasantness of turning a patron away and let it slide, since that’s what ultimately happened anyway. What to do: Don’t expect lifeguards to turn people away if you are not willing to turn people away. Alternately, the business office could simply issue a temporary pass after checking the person’s identity. At least this enables the lifeguards to be consistent. Reason: Lifeguards would rather avoid a confrontation. Patrons will take advantage of holes in policy and often lifeguards will enable (and sometimes encourage) it. In communities where pass-sharing is a problem, I rarely see lifeguards go out of their way to “bust” somebody. Develop a pass policy that is easy to enforce and hard to break. [See post]. In communities with policies riddled with holes, managers may feel that policy is simply not being enforced; pool usage is up but money collected is down. However it may not be the patrons or staff; it may be the rules/policy. Reason: Lifeguards are unlikely to consistently follow complex pass policies. Rules are seldom followed if staff struggles to understand them. Here is an example of a complex system. All patrons must have a pass issued this year, or have a light green sticker on a previous year’s pass, or be on the commercial property list. Patrons cannot have the following letters next to their name on the Do Not Enter List: EX, EN, or AT. Patrons with PP next to their name are allowed even if they have an EX, EN, or AT. They are on a payment plan. Patrons may not bring guest that live in the community. All guests must show a photo ID that states their address. The following is a list of street names in the community: Main Street, Maple Street, Elm Street, etc., etc., etc. • Issue all patrons passes every year. • If you implement a Do Not Enter List, only add names of people who may not enter. Update it often. When it comes to enforcing a pass policy, the customer is not always right. If the patron did not receive a pool pass because they did not follow the community’s pre-established policy and procedure, that guest should not be allowed to enter the pool. Lifeguards are worried that if the patron complains about being turned away, they will also complain about the lifeguards poor attitude, rudeness, immaturity, etc. This happens quite often. Rather than risking a complaint against them, they let the patron enter. What to do: Managers need to be aware of this. I have been asked by property managers to discipline my lifeguard staff not because they enforced the pass policy, but because they had poor customer service. It is possible that they provided poor service, however a frustrated customer is likely to perceive the customer service as poor if they aren’t getting what they want. When lifeguards are disciplined when enforcing policy, the result is they stop enforcing the pass policy. Reason: Lifeguards are “kids” who aren’t used to disciplining adults. As managers, it is our responsibility to put employees into positions where they can be successful. Lifeguards don’t start the summer intending do a bad job. By understanding some of the challenges that your guards face every day, you can bring out the best in your staff and provide better service to your patrons. If you’re having trouble establishing or enforcing your pass policies, we’d love to hear from you. Maybe we can help!